Oh, that stonework is lovely! I'm glad to see the pizza oven. I was wondering where your bread oven was, and here, your bread will be pizza! Sorry, I confuse myself! I go back and forth on whether to call it a bread oven or a pizza oven, but it's the same oven!!! Before long, I'll be calling it the pig-smoker. Just depends on what I'm hungry for that day I guess. heh heh. It's got a long ways to go, but I'll get there. You have a great start. 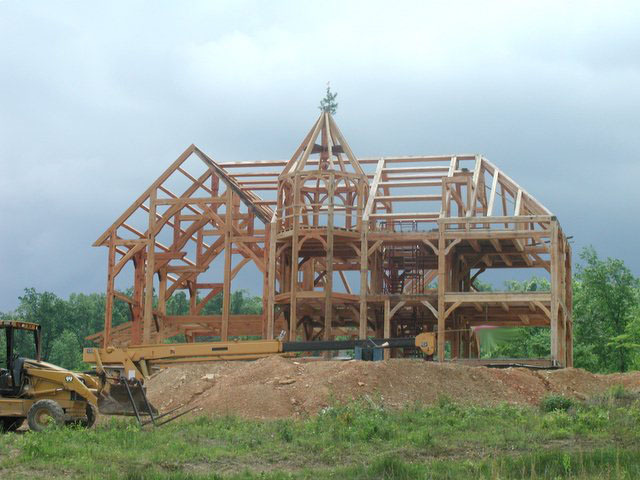 I've already added your blog to my offsite links (list of DIY timberframers with blogs). Your first pieces look absolutely great. I like the fact that you are following the K.I.S.S. rule. Similar bents through-out. It will take a while but you could very well finish before me given my pace and unnecessary complications!